We invite you to join us on the unique and serene island of Kalymnos for a week-long retreat focusing on the daily practice of Hatha Yoga. 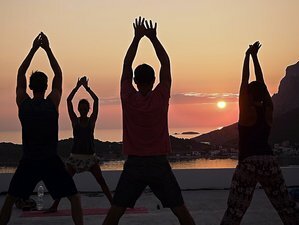 This course is designed for all levels of practitioners and our main goal is to share the mental and physical benefits of Yoga, while encouraging our participants to use this precious time to devote each moment to their individual wants, needs, and desires, combining Yoga with many other activities available on this hidden Aegean gem. The accommodation for this retreat is in the newly built apartment complex called Climber's Village, which recently opened in 2018. The fully modern apartments consist of two bedrooms with two single beds in each, as well as single apartments with one bedroom, modern bathroom facilities, fully equipped kitchen, air-condition, and a large patio overlooking the beautiful island of Telendos. The daily schedule begins with an 8 o'clock morning session (an hour and a half) and is followed by a healthy breakfast. Afterward, the day is free for exploring the many unique beauties of the island, whether it be swimming in the clear Aegean Sea (there are numerous beaches within walking distance), snorkeling, hiking in the mountains, scootering around the island, and not to mention trying Kalymnos' world famous sport, rock climbing! There will be two sunset sessions of yoga or meditation (base on the preference of the group) offered during the week on the beautiful terrace overlooking the ocean. Afterwards, guests are welcome to either cook your own dinner (as each apartment has a fully equipped and modern kitchen) or explore all the local and eclectic restaurants (suitable for all tastes and budgets) which are within walking distance from your apartment. The accommodation is a newly built apartment complex overlooking the sea and walking distance from the main town of Masouri. Rest of the day free for an individual relaxing time or arranged activities (with aid of hosts) such as scooter rental (international driver's license required), rock climbing, scuba diving, and of course therapeutic massage. Many other activities are free of costs such as swimming, hiking, walking, and snorkeling. There will be two evening (either meditation or yoga) sessions offered according to the day and preference of the participants. Eva is a 500 hour Yoga Alliance certified Hatha Yoga Instructor who began her teaching career on the island of Kalymnos, Greece, a world renowned climbing destination. She is skilled at teaching people of all levels, from beginners to advanced, and works well with groups as well as individuals. She has been the lead yoga instructor in numerous retreats, including collaborating with the French company Copines des Voyage, as well as the Dutch based company Vakantie Op Kos. Her passion is spreading and sharing the philosophy and practice of Yoga with aim of inspiring personal growth and change! Mario is a certified Yoga teacher and has been teaching since 2012, He has also 18 years of experience in holistic body work massage. He is well active in London as a Yoga teacher in schools, and as a practitioner hired by companies as well as private clients. He has led many teacher training programs and workshops in France, Greece, and Spain, and incorporates a detailed knowledge of human anatomy in his Yoga classes, encouraging the balance between mind and body. He is also a fully certified therapist focusing on postural work and massage/sport therapy and will willingly offer his services! Climber's Village is located in the center of our little beach town called Masouri, which is full of restaurants, shops, bakeries, bars, and mini markets all within walking distance from the apartment complex. Please book your flight to arrive at Kos Island International Airport (KGS). From the airport, it is a 15-minute cab ride (also buses are available for those looking to save some money) to Mastichari Port. Ferries depart there frequently (Yoga Holidays on Kalymnos Island, Greece can help with the timetable based on your provided arrival time at Kos Island International Airport (KGS)) to Kalymnos port. The cost is 7.50 EUR. They will be waiting for you at the port to take you directly to your accomodation. Eine Reservierung erfordert eine Anzahlung von 20.57% des Gesamtpreises. Der Restbetrag ist 15 Tage vor der Ankunft zu zahlen.